Fashion is having a Martin Margiela moment, and now museums are following suit. As Paris gears up for a Margiela. Fashion is having a Martin Margiela moment, and now museums are following suit. 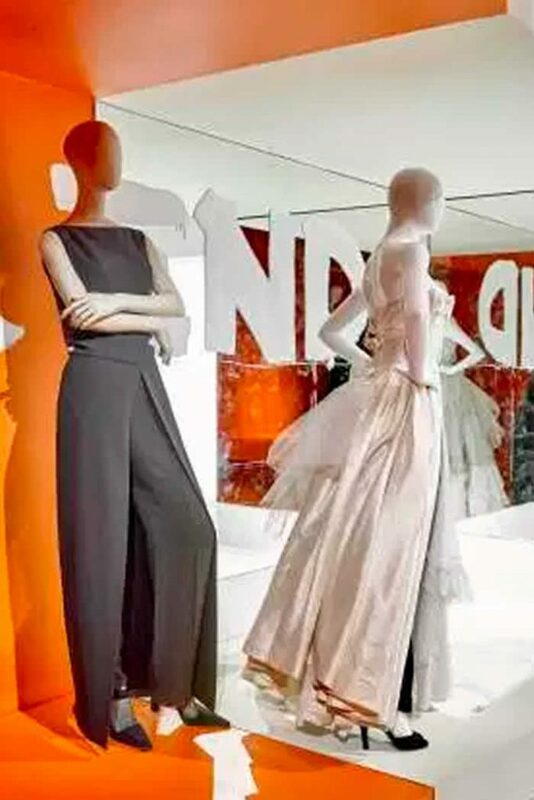 As Paris gears up for a Margiela retrospective at Palais Galliera in 2018, an exhibition in Antwerp focuses on the Belgian designer’s work as artistic director of women’s ready-to-wear at Hermès between 1997 and 2003. “Margiela: The Hermès Years,” opens at MoMu Fashion Museum Antwerp Friday. The show was designed in collaboration with the retired designer, who stayed true to his reputation as fashion’s invisible man by skipping the vernissage on Thursday night. Margiela also worked on the accompanying catalog, which he dedicated to Jean-Louis Dumas, the late Hermès chief executive officer who hired him, and Jenny Meirens, cofounder of Maison Martin Margiela. Kaat Debo, director and curator in chief of MoMu, believes the time is right to revisit Margiela’s work at Hermès, both because of his continued influence on designers including Demna Gvasalia, Kanye West and Phoebe Philo, and because his respectful attitude to women resonates at a time of worldwide protests for women’s rights. “You can’t overestimate his influence. What he proposed at the end of the Eighties, beginning of the Nineties as avant-garde fashion has become mainstream,” Debo told. “I also noticed that this particular body of work his collections for Hermès was not really well-known. You don’t find a lot of imagery. Of course that has to do with the fact that he worked there at the end of the Nineties, beginning of 2000, which is the pre-digital era, before the big boom of social media,” she added. The exhibition compares and contrasts Margiela’s designs for Hermès with those he produced for his own label, using each house’s signature color orange for Hermès, and white for Maison Martin Margiela as a backdrop throughout. An oversized biker jacket in distressed leather sits next to a butter-soft lambskin robe coat. A feather-light cashmere seamless sweater is juxtaposed against a top assembled from recycled Army and mountaineering socks. “I feel that it certainly is two translations of one creative DNA. At first glance, it may look like two very different worlds: the world of avant-garde fashion and the world of luxury fashion. But if you look closely, you feel that it’s one vision and also one strategy, and that’s very interesting,” said Debo. The majority of the Hermès pieces are on loan from the French luxury firm’s archives in Paris. “With these seven words, he managed to get the absolute trust and respect of my father,” Dumas told a news conference at the museum on Thursday. “He helped us enter the 21st century with a renewed vision for Hermès, I would say a vision based on an absolute confidence in our values, in our strengths and infinite possibilities to play with these values, as long as you make it simple,” he added. Dumas, who worked with Margiela on his last collection for Hermès, recalled that the designer introduced a button with six holes, so that the thread used to sew it on spells the letter H. “This is a detail which says, I think, everything about his attention, his vision and the strength of his design,” he remarked. The exhibition is divided into 14 sections with names such as Icons, Layers, Leather or Evening, highlighting Margiela’s signature items such as trenchcoats, white shirts or suits and techniques, such as his use of layering or fascination with linings. A series of specially commissioned videos, featuring Axelle Doué, Anne Rohart and Shirley Jean-Charles three women of different ages who modeled for Margiela during his Hermès years illustrate the transformable nature of many of the clothes. Hence, a trenchcoat from spring 2003 can be worn with the arms inside or outside the sleeves, or with the sleeves completely detached, while a jacket and duffel coat from fall 2000 can be transformed into minimalist versions by removing their collars and leather buckle straps. Organizers felt the videos were necessary because the depth of Margiela’s innovations at Hermès are not immediately apparent to the naked eye. 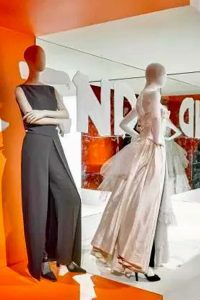 “When you go through the reviews of the collections of that era, you feel that a big part of the press didn’t grasp all the innovations, all the ideas within these collections, and that has to do with the fact that he designed the garments from the point of view of the comfort of the women wearing them,” said Debo. “It’s very difficult to visually communicate innovations in fabrics and innovations in techniques, the different ways in which you can wear one single garment, and that’s exactly the genius of these collections,” she added. Highlights include a black leather coat with a removable shaved mink lining that is a technical marvel: In contrast with the apparent darts and seams Margiela liked to use for his own label, not one stitch is visible on the glossy black leather, making it the definition of understated luxury. Having obtained carte blanche from Dumas, Margiela refused to go down the obvious route when incorporating the historic house’s signature elements. He created a dress from vintage scarves for his own label, but then refused to work with prints at Hermès, known for its luxurious silk carrés. Instead, he used their traditional hand-rolled edges to finish blouses and tunics. Similarly, he repurposed the Toile H écru canvas used for suitcases and bags as a more supple material for clothes, and updated the Cape Cod watch with a strap that wrapped twice around the wrist, in a style that was widely copied. It’s not the first time that MoMu has staged an exhibition dedicated to a living designer, but Debo said Margiela’s cooperation was key. “We deal with a lot of people working also with him, stylists, people from the ateliers, but his feedback was absolutely crucial to us both for the book and the exhibition. And he also helped us in the selection of the looks and giving us feedback on the concept and the exhibition design, the graphic design of the book,” she said. “I would never do an exhibition on a living designer without their explicit approval. I feel that’s very important because we do the research, we make the analysis, but they often help us to create their visual world,” the curator added. Debo said she was nostalgic for the vision and strategy, which left his brand in 2009 after it was bought by Italian entrepreneur Renzo Rosso’s OTB group. She offered her take on his continued appeal. “I think certainly now that the system of fashion is so much under pressure, a young generation of designers doesn’t feel at home anymore in the fashion establishment and they’re looking for new business models, trying to find ways to do their own thing. “Then again the fashion establishment and the bigger brands and houses are very much under pressure, trying out new models, new ways of distributing, communicating, selling their products, and I think in such a climate, Martin’s vision again becomes very refreshing and very relevant. “Whether it be more traditional designers or very experimental, conceptual designers, somehow they all end up with Martin Margiela, and that is, I think, unique,” she concluded.